Forest Golf and Beach Residence is one of the best properties listed in Cyprus44 property reviews. PI Property International plc was founded in 1986 by entrepreneur Ali Ozmen Safa, who first began in business refurbishing properties in London, UK. He then set up the company to sell similar services to investors, and expanded into the off-plan property market. Over the last six years, Safa has been involved on investments worth in excess of £200m by buying entire developments off-plan and selling properties on to individual investors. PI now offers a Triple Protection guarantee of a guaranteed return for a fixed number of years with a guaranteed buy-back at the end, and a fixed return on any money invested. 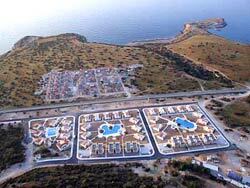 Safa expanded into property in North Cyprus in 2002, and in 2007 he will have completed over 1250 units. His local company Medview Homes now manage many properties for investors and holiday makers alike. They have even built their own desalination and water treatment plant in Bogaz to overcome water shortages. Future plans include a car hire company and an airline! The Forest Golf and Beach Residence is just five minutes from the major draw at Esentepe, the new 18 hole golf course, and just five minutes from the beach for anyone who thinks golf is a good walk ruined! This smaller development of one and two bed apartments plus detached bungalows, is designed as two squares of properties surrounding two central swimming pools, plus a smaller rectangular area, and the River apartments beyond. The sea lies beyond the road to the north of the site. There are three types of property at the Forest Golf and Beach Residence; the Rapsodi, Opera, and River Apartments. The Rapsodi two bedroom two bathroom apartments have sea views from their terraces, a kitchen / living room and the bedrooms arranged at the rear of with another, smaller terrace. The ensuite bathroom for the master bedroom is, somewhat unusually, set out from the main villa at the end of the staircase leading up, a good use of otherwise dead space. The Opera two bedroom two bathroom detached bungalows have curved panoramic living rooms windows, to maximise the view of the Mediterranean Sea beyond. This gives the bungalows an elegant 1930s feel, and an attractive living space that blends effortlessly into the fitted kitchen area and out onto the terrace. There is also a small roof terrace tucked above the attractive red roof tiling. The affordable one bedroom River apartments are just 200 metres from the sea, and have probably the best views of the sea of the whole development. For just under £40,000, you get a double bedroom, bathroom with bath and shower, kitchen and living room, plus furniture, white goods and air conditioning. However, the terrace is small, and the flat has a rather dull four-square design. The Forest Golf and Beach Residence site includes a swimming pool, landscaped gardens, a bar/restaurant, mini market and management office for those wishing to let out their investment property in Esentepe, North Cyprus. At time of writing, there are two Rapsodi villas available at £69,000 including white goods and air conditioning, two Opera bungalows at £92,950, and most of the River apartments, starting from £34,950. 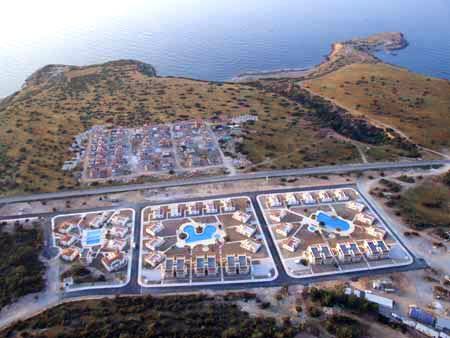 The annual site maintenance charge is £475, a fact to take into consideration if looking for an investment property at the Forest Golf and Beach Residence, Esentepe. This web page is served on 19 April 2019 at 23:17:17.